A Casinha D’Avó Bia is located on Rua Doutor Joaquim Jacinto in central Tomar. The restaurant occupies an ideal position close to the river in one of central Portugal’s most visited cities, famous for its UNESCO World Heritage Sites and historic significance. 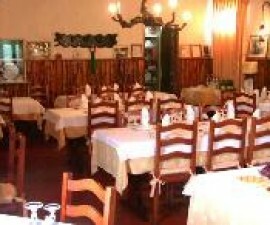 This is a small restaurant with a capacity for just forty diners, giving it a cosy and welcoming ambience. The décor is simple rustic, with wooden floors, solid furniture and warm earthy colours. Daily specials are hand-written enticingly on a blackboard alongside recommendations from the chef and diners eat to the accompaniment of an interesting selection of music played at a low enough volume to ensure that it is not intrusive. This is the perfect location for a quiet meal for two although families and groups are also welcomed. A Casinha D’Avó Bia is something of a favourite in Tomar, serving good food at moderate prices. The chef, João Silva trained in Switzerland and worked around the world before returning to his native Portugal, bringing with him a style based on nouvelle cuisine and touched by unique inspirations gained through his travels and experiences. The main ethos of his approach is to focus on fresh, high-quality ingredients and to let those ingredients speak for themselves. His dishes are light on sauces and strong on flavour. Popular main courses include fish fillet with almonds, chicken with stir fried vegetables and cashew nuts, pork fillet with honey and sesame seeds and garlic prawns. Not one to rest on his laurels, João Silva produces weekly and daily specials based on regional recipes from every corner of Portugal as well as favourites from Madeira, the Azores, Cape Verde and Brazil. Portion sizes are small to moderate so large appetites may be left wishing for a little more but for those who do feel in need of a bit more of a fill the dessert trolley is highly recommended. There is a varied wine list with good local and national names. Try the Vinho Casal das Freiras Syrah, 2008. Service is very friendly and helpful and many staff speak some English and other European languages. 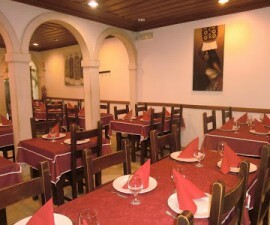 Average price per head is €20 – €25, making this good value for the quality in comparison to other restaurants in Tomar. 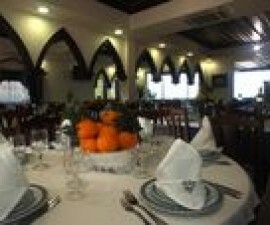 A Casinha D’Avó Bia is open daily for lunch and dinner, closed Sunday and Monday midday.